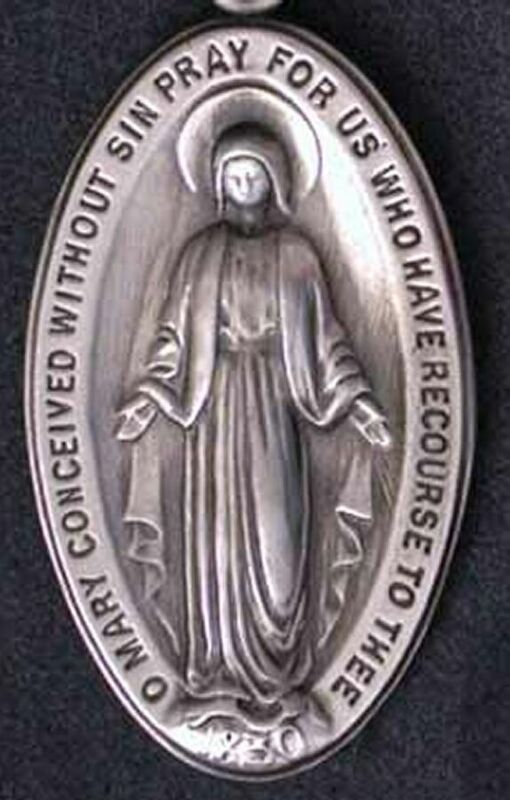 The words and images on the front of the medal, “O Mary conceived without sin, pray for us who have recourse to you,” express a message with several tightly connected aspects. Mary’s identity is explicitly revealed to us in these words; the Virgin Mary was immaculate from the moment of her conception. Furthermore, the power behind her intercession for those who pray to her comes from this privilege, derived from the merits of the Passion of her Son, Jesus Christ. For Jews and Christians, the serpent personifies Satan and the forces of evil. Mary calls us to enter with her into God’s sacrificial love in the world, which is opposed to the materialism of the world. This requires the true grace of conversion which Christians should ask of Mary. The Blessed Virgin’s hands are open, and from her fingers are rays of light. Mary explained to Catherine that these lights represent graces given to those who ask for them. This is an indication that the grace of God flows through the Blessed Virgin Mary to us, not unlike the grace that incarnated Jesus Christ in her. 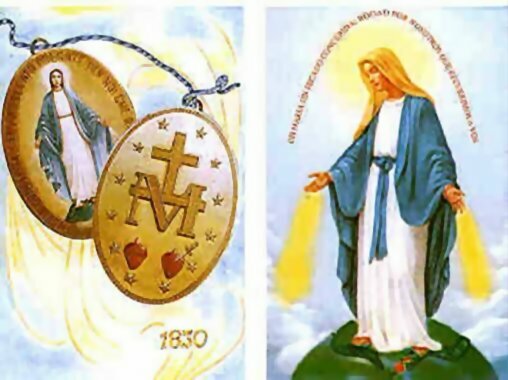 On the back of the medal, a letter and drawings introduce us to a symbol of Mary and Jesus. The letter “M” is surmounted by a cross. This “M” is Mary’s initial, and the cross is the Cross of Christ. These two interwoven signs signify the inseparable relationship that connects Christ to his Holy Mother. Mary is associated with the mission of human salvation through her Son, Jesus. It is through her compassion and suffering that she unites herself to Christ. 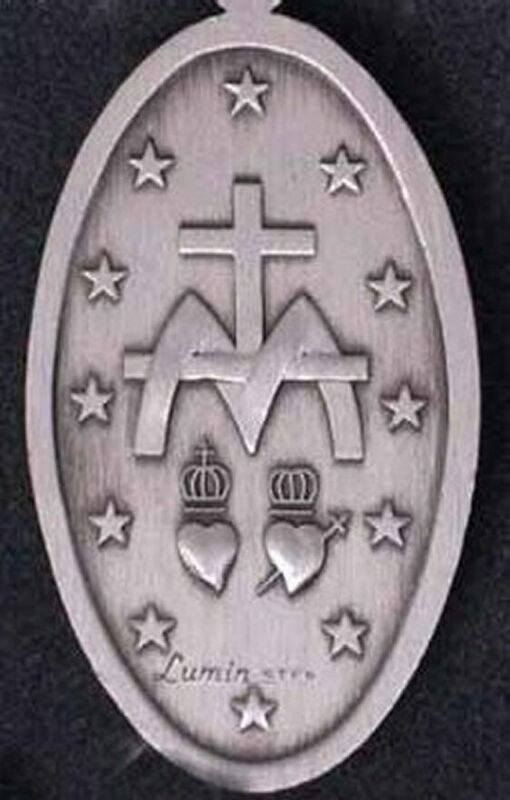 There are two hearts towards the bottom of the medal: one encircled by the crown of thorns, and the other pierced by a sword. The heart crowned with thorns is the Sacred Heart of Jesus. It represents His passionate love for humanity. The heart pierced by a sword is the Immaculate Heart of Mary, his Mother. It recalls Simeon’s prophecy the day Mary and Joseph presented Jesus in the temple. These two hearts being depicted side-by-side indicates that Mary’s life is one of intimacy with Jesus. Finally, twelve stars are located on the reverse of the medal around its edge. They can represent two entities: the twelve tribes of Israel (linking the Old Testament to the medal); and the twelve apostles, who founded the Church. To belong to the Church is to love Christ and to participate in his passion for the salvation of the world. Each baptized person is invited to become a part of the mission of Christ by uniting his heart to the hearts of Jesus and Mary. The medal calls to us to choose, as did Christ and Mary, the path of love of our enemies, even unto the total sacrifice of self.